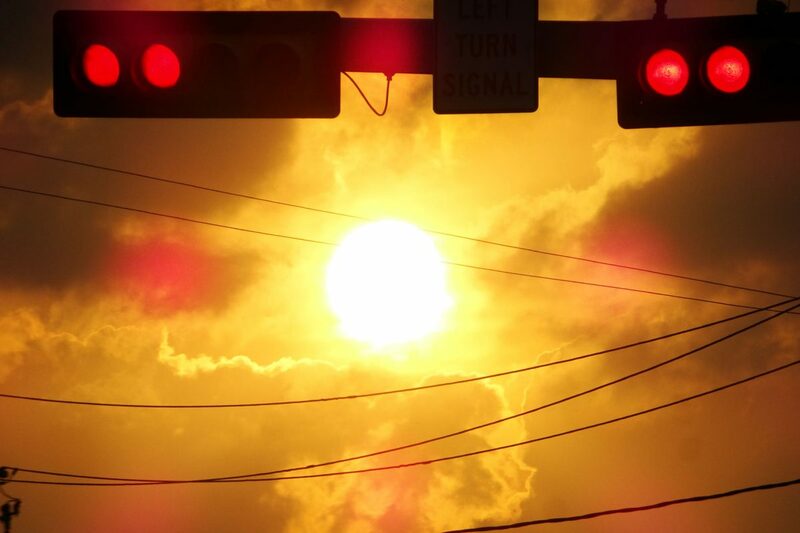 A traffic light turns red as the sun sets in Brownsville. HARLINGEN — So much for spring. Temperatures for late May are nearing record-breaking territory up and down the Rio Grande Valley in a weather pattern more suited to mid-summer. Yesterday unofficial temperatures three weeks before summer arrives reached 95 in Brownsville, 97 in Harlingen and 100 in McAllen. All of the readings were just below records for the date. The previous day, Memorial Day, McAllen tied its high for the date with a reading of 101 degrees. That record was set just last year. In Harlingen, Monday’s temps reached 98, well below the record for the date of 104 degrees set in 1973. Brownsville reached 97 degrees, one degree under its all-time high for May 28 set in 1919. Meteorologists at the National Weather Service in Brownsville say the weather pattern which smothered the Valley over the Memorial Day holiday isn’t going to relent until next week at the earliest. “It looks like we got a jump on summer,” Mike Castillo, senior forecaster at NWS in Brownsville, said yesterday. Problem is, the possibility of any relief is going to remain over the horizon until next week. The weather service issued a heat advisory yesterday as the “feels-like” temperature rose to between 105 and 110 degrees over much of the Valley. Those cautions are expected to be issued daily at least until next week. Actual temperatures through next Monday are forecast to range from the low 90s along coastal Cameron and Willacy counties to as high as 100 to 104 in the Upper Valley for the next six days. Harlingen and McAllen will probably push or pass the 100-degree mark most days and Brownsville could reach triple digits by the weekend. “The computer models that we’re looking at, the forecast models, they don’t see a lot of changes,” Castillo said. “Maybe a weak upper-level trough of low pressure that may move in after next week, that might at least let the temperatures come down a couple degrees. “We might see some more cloud cover and maybe some sea breeze showers in the afternoon,” he added, “but that’s beyond Day Seven, so right now that’s still quite a ways away.